I have a special #MagazineMatch for you because I replicated TWO looks. It was hard to choose just one, so… I didn’t! It’s been a rainy week here in Central Ohio, so I was in some major need of summer cheer and these looks delivered! You have to have both of these summer looks in your house, you won’t regret it. Pinky promise. Flowers and bright colors are must-haves during the summer. There are so many beautiful, colorful pictures in issue #222 of Vintage Style, but this one made me pause and smile. The setup is perfect for your coffee table, or as a centerpiece in your dining room. Gorgeous colors, right?! The little bluebirds are actually candles! An alternative to wax candles: LED tealights! LED candles are great because theres’s no worry about an open flame, and you get the same soft glow. Our rusty bird tealight holders, available in two sizes, brought the country feel that KP Creek is all about! I have one vase that I always misplace, so when my husband brings me flowers, they get put in random containers. Using non-traditional containers as vases adds character to your floral arrangements! I grabbed a chicken wire lantern and a mason jar to bring more rustic country vibes to the display. The mason jar has little stars embossed on it, and if you remember from the DIY Wreaths post, I LOVE stars so I had to use this. Flowers are fun because whatever you pick can showcase your personality. I like bright flowers, and my favorite colors are pink and purple. Choosing pink baby’s breath, and purple wild mums, was a no-brainer. I used two of each floral to make the arrangement fuller. What florals would you use? Let me know in the comments! For ours, I used our enamelware soup plate as the base. The dark, distressed edges gives the place setting an extra rustic touch. 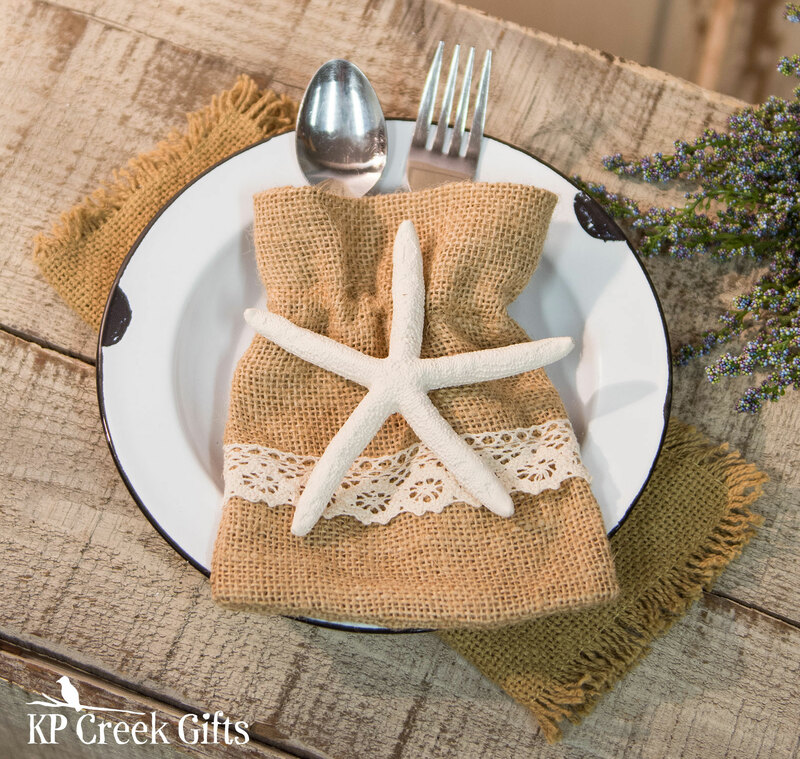 Country Sampler gives a DIY on how to create the silverware pocket, but KP actually has burlap pocket with lace that worked perfectly! And now, what brings it all together and completes the beach look: the resin starfish! The starfish sells as a set of four; the perfect number for a small dining set. The final layer is a folded burlap table mat, and VOILÀ! Now you have a complete country beach place setting in just a few easy steps! Ahh, check out the realistic details of the starfish! It looks great against the burlap texture and lace. Would you add anything else to these fun summer displays?